Have you ever seen that parenting meme with Gandalf from Lord of the Rings staring stoically and bravely off into the distance? Beneath him are the words: “When you hear your kids wake up in the morning … so it begins.” That meme always makes me laugh, while also giving me a slight sense of parenting anxiety. Kids. We love them, we cherish them, and we celebrate them. But man, do they make us tired! From the moment they are born, it is a nonstop carousel of feedings, naps, play dates, and cleaning up something. And just when they barely – and I mean just barely – make it out of the diapers and temper-tantrum stage, it’s time for that second phase of parenthood. I like to call it the What should my kid do now? phase. This is the phase when we – in our probably still sleep-deprived minds – decide that our kids are at the age where they absolutely must do something with their cute little talented selves. As if we aren’t all busy enough with our jobs and schools and other obligations, we just can’t stop thinking about how our son or daughter will look totally adorable in that little baseball uniform or dance recital outfit. We can’t wait to cheer them on from the sidelines as they make that game-winning shot or goal, or proudly film their first guitar recital and shoot it off to Grandma, tears streaming down our faces. Our daydreams vary vastly from the reality. We soon find ourselves running from one end of the county to the other, coordinating a carpool schedule that would befuddle even the Secret Service, while trying to inhale Chick-fil-A nuggets that were intended for our kids on our way from the field to the court to the next lesson. I really don’t know what gets into us. I mean the tutus and miniature baseball pants are cute and all, but I often wonder in the middle of all of the chaos: Where is the time for all of the other stuff that is supposed to make us more normal? You know, the important things like family meals, staying fit, date nights, and – dare I even say – nap time? Yes, our kids are a priority, but how can we maintain a healthy balance for the family when we seem to be pulled in a million different directions? What Do Families Choose for Kids – and Why? It’s not like you take a big roulette wheel labeled with baseball, soccer, piano, martial arts, theatre, scouts – you get the idea! – and just spin to see where it lands. Picking an interest usually comes from one of two ways: Your kid wants to do it, or you want your kids to do it. Many parents have a desire for their child to pick an activity they themselves once participated in. Other times, our children pick a sport or interest after watching their friends or family members, or they might choose something they have seen online or on television. Adina Silvestri, a licensed professional counselor and founder of Life Cycles Counseling in Richmond, advises parents to dig deeply into why they are choosing to sign up a child for a certain sport or activity. “Is it for the child, or is it for you? Are we trying to be the number one parent who can do it all, or are we trying to give our children the childhood we never had?” Reflect carefully on the reasons why you choose to add things onto your collective family plate because invariably, you are choosing to introduce added stress into your life. Once your kid has a clearer vision of his passions, it’s time to figure out how to fit it into your already jam-packed life. With many parents working outside of the home, transporting your children to and from different activities can be a tiresome and often confusing ordeal. Sunday night meetings have worked wonders for many families riding the over-scheduled roller coaster. Sitting down with the kids and the calendar and laying out expectations for the week can decrease stress levels immensely. Kerry Power of Midlothian and her ex-husband William make sure to stay in constant communication when it comes to who is picking up their children, Garnett and Mason. “It can be hard when you are not in the same household, but William and I definitely work together to make sure everyone is where they need to be when they need to be there.” Kerry recommends Google Calendar and texting to help parents – married or not – stay on the same page. I am thankful my own two boys, Brady and Elijah, both enjoy one sport and one sport alone: basketball. That sort of consolidation makes for a much less stressful time when running to practices and games. However, it’s important to keep in mind parents shouldn’t require or demand that all of their kids participate in one activity because one of their kids enjoys it. Children should be allowed to pursue their individual passions, which at times can be on completely different ends of the spectrum. 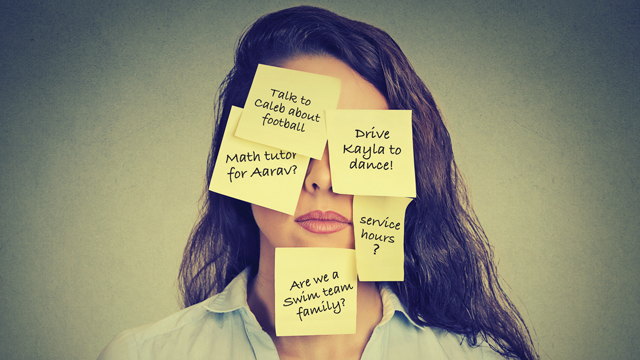 Even when you have figured out a successful way to get one child to soccer in Chesterfield and the other to ballet in Richmond, you still need to make sure you are scheduling time for yourself. “We often tend to put our kids ahead of everything else, including our own personal well-being,” says Dr. Silvestri. “Practice slow-down techniques, and ask, What do I need that I am not giving myself?” Don’t feel guilty about taking a nap or taking twenty minutes to read or watch that favorite show on Netflix. Staying healthy is also critical for overrun parents. Schedule time for early morning workouts or evening walks with your family. For Kerry, it means spending time with friends and traveling when she can get it into the schedule. Lizz and Corey also make sure to get in a date night once or twice a month – with no talking about the kids’ sports allowed. As busy families, we get used to eating dinner and catching up in the car between activities or late at night once we’ve returned home. However, it’s important to remember that family time should not just revolve around what your kids are doing. Carve out time in that busy schedule for down time, not just by yourself, but for down time together as a family. Dr. Silvestri suggests instituting a screen-free time for a few hours on nights you are all home. Spend that time reading together or just enjoying each other. Can We De-Stress this Summer? Whatever your chosen family pursuits, summer can be a great time to embrace a feeling of freedom from those stressful schedules. Family vacations and warm peaceful nights are great ways to soak up extra time together. My boys enjoy getting out on the river to fish with their dad and spending time at the pool with friends. Summer days are also a great opportunity to just sit around and do nothing together. Spend a 100-degree day watching all of the Marvel Avenger movies or making a fort village in your den. Brady and Eli even discovered a love for baking on a boring summer day and now they love to experiment in the kitchen as much as possible. Summer gives families the perfect time to decompress and bond without worrying about when the next game or rehearsal is. We all want our children to lead lives that are joyful and fulfilling. (That’s what I want for my husband and me, too!) Our children’s passions can help shape them into the adults they will later become. Sports, the arts, and other activities help teach a slew of important skills – like how to deal with defeat, communication, and how to get along with others. Even so, we still have to think about what’s best for the well-being of the entire family. At the end of the day, our children’s passions are important to us, but they do not need to be at the center of our family life. Spending quality time together, and supporting and celebrating each other through all of life’s ups and downs are what should be at the top of any family credo. And yes, sadly, this roller coaster will come to a stop one day. You will find yourself faced with an entire Saturday filled with absolutely nothing to do and wonder how it all went by so fast. Have no fear, your grandchildren will soon start calling, wondering what time you are going to be at their games and whether or not you can take them out to lunch afterwards. Just in time for the next phase to begin! Previous articleWelcome to Kid City! An educator and mom to two tween boys, Paige Tucker lives in Chester with her family.